He was a 7-3 mix of Bird, Maravich, and Kareem, but the question surrounding Arvydas Sabonis will always be "What if?" Bob Whitsitt could never get a straight answer on Arvydas Sabonis. In 1994, Whitsitt arrived in Portland and was tasked with remodeling an aging Trail Blazers roster. Nobody in the organization knew Sabonis’ level of interest in coming to Portland. He had become a mythical figure — out of sight, but seldom out of mind. The Blazers first drafted Sabonis with the 24th pick in the 1986 draft, but he declined to come over to play in the United States. Although most involved speculated that the reason was political, nobody could quite define the exact motive. In the eight years between being drafted and Whitsitt’s arrival in Portland, Sabonis had transformed from prodigy to a full-fledged international star. That much was evident. After scouting him for a year, Whitsitt finally pinned Sabonis down for dinner in Madrid, the latest stop in a meandering life that started in Kaunas, Lithuania. Sixteen years later, Whitsitt remembered how the dinner had started late — real late — wreaking havoc on his circadian rhythm. More important, Whitsitt remembered marveling at Sabonis’ hands. They were huge, Whitsitt recalled, but they also served food in the same delicate manner with which a surgeon would handle a scalpel. In professional basketball, shorter players are just as likely to draw as many double takes as the taller ones. Tall is average. Of the players I’ve seen in person, only two amazed me by their sheer size alone: Shaquille O’Neal and Yao Ming. Now there’s Sabonis. At 7 feet, 3 inches, he is the tallest member of the Hall of Fame. But unlike Yao, who, despite his broad shoulders, still stands a bit skeletal, or Shaq, who ballooned as his career progressed, Sabonis’ body is still roughly proportionate to a normal-sized man. I’d be surprised if he weighed much more than he did in his playing days. Sabonis suffered the big-man’s curse. It is the irony of the game that often some of the bodies built for basketball are ultimately too delicate to handle how the sport pounds the feet, ankles, and knees. The bigger the body, the greater the chance that a tiny abnormality can halt a brilliant career and crumble it like a misplaced Jenga block. Bill Walton and Yao Ming are among those whose sparkling careers were derailed by debilitating injuries. But at least the NBA’s audience witnessed them, appreciated the development of greatness even if the peak was abbreviated. With Sabonis, we are left only with a dabble of YouTube clips filmed long before YouTube was created. “I am no longer a locomotive, only a small trolley,” Sabonis once told the Oregonian after he arrived in Portland. Before him now, I wondered if Sabonis’ legend would be greater in the United States if he had never arrived at all. Sabonis offered his hand. Whitsitt had not been lying. Mine disappeared as we shook. Sabonis was accompanied by family members in a secluded room on the Hall of Fame’s second floor. We sat away from them in a corner of the room. Sabonis struggled to ease his rear end into his chair. He was not as forthcoming in the interview as his fellow inductees had been about their memories of the game. Part of the problem could be chalked up to the language barrier — Jay Jensen, Portland’s athletic trainer, doubts Sabonis’ English has improved or declined since the day Jensen picked him up at Portland’s airport in 1995. But even in his NBA career, Sabonis shied from the media spotlight — part of his hesitance on this day could be attributed to a genuine sense of humility. If Sabonis arrived in Portland unscathed, he could have had a Michael Jordan-like impact upon the game, Whitsitt said. He hedged on the comparison by saying that the point is definitely arguable. But the statement was made because Whitsitt believes in its possibility. He is not alone. Walton first saw Sabonis as a 19-year-old in the European championships. “He probably had a quadruple-double at halftime, and his coach, Alexander Gomelsky, didn’t even start him in the second half,” Walton said in a telephone call. “We looked at each other, our jaws just dropping, and I said, ‘You might as well just rewrite the rules of basketball after watching him play for just the first half,’ the first time I ever saw him. When you think of the history of basketball, the rules were changed to make it harder for three guys: Russell, Wilt, and Kareem. All the other rules have been changed to make it easier. Even before he came over to the NBA, Sabonis was slowed down by two ruptured Achilles and an assortment of foot, ankle, and knee injuries. The first occurred at the age of 22, in 1986, the same year Portland drafted Sabonis 24th overall.1 Sabonis found out about his selection from reading it in a magazine article, uncertain of what it would eventually mean but certain the NBA was not a current option because of the political climate in his home country. The original injury is still a point of contention. Sabonis believes it was caused by overtraining by his Soviet national team. Although Sabonis never regained full mobility, he became Europe’s most decorated player and showed a knack for unleashing his finest performances on the biggest stages. That game carried implications that still impact international basketball. It marked the first time that the United States did not qualify for the gold-medal game in basketball, and it preceded the creation of the Dream Team. Four years later in Barcelona, the stakes had completely changed. In 1988, Sabonis was playing for the Soviet Union. In 1992, he was playing for his native Lithuania. As such, he regards those Olympics as his greatest basketball triumph, mostly because they included a game in which Sabonis and his Lithuanian teammates defeated the Unified Team, a squad consisting of members of the fallen Soviet Union. Sarunas Marciulionis scrambled to put the team together, largely helped by Donnie Nelson, then an assistant for Golden State and now an executive with the Dallas Mavericks. Nelson located funding for the team after members of the Grateful Dead read an article about its need in the San Francisco Chronicle. The band’s Rex Foundation supported the team. 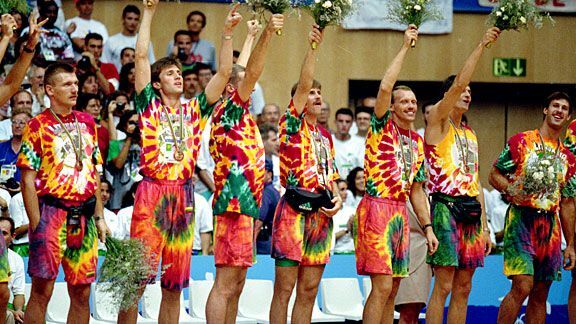 The Lithuanian members wore tie-dyed warm-ups. Sabonis scored 26 points and pulled down 16 rebounds in the bronze-medal game. Sabonis was located a couple of days later in one of the women’s Olympic dormitories. The first influential imports arrived in the NBA in 1989. FIBA, the international governing body of basketball, permitted NBA players to play in the Olympics. The decision allowed foreign-born players to play professionally while still remaining eligible to represent their home countries in international play. The first class of imports included Sabonis’ fellow countryman Marciulionis (Golden State), Vlade Divac (Los Angeles Lakers), Alexander Volkov (Atlanta), and Drazen Petrovic (Portland). Others close to Sabonis at the time who asked not to be identified say that Gomelsky received some of Sabonis’ paycheck and had financial incentive in keeping him away from the NBA. Gomelsky, according to the sources, told Sabonis he would be putting his family in harm’s way if they moved to America. Sabonis said that he did not believe his body could hold up to the rigors of the professional basketball in the United States. Sabonis joined Real Madrid in 1992 and won two Spanish League titles. George Karl spent two stints coaching the club from 1989 to 1992. His main regret from that period of time is that he left Spain before having the opportunity to coach Sabonis. In 1995, Sabonis appeared ready for a challenge that had awaited him for years. He met with Whitsitt for dinner in Madrid. Whitsitt asked Portland’s team physician, Dr. Robert Cook, to take a look at Sabonis’ X-rays before he arrived. Cook asked Whitsitt if he was sure his new player could play. “He said that Arvydas could qualify for a handicapped parking spot based on the X-ray alone,” Whitsitt said. Few can understand Sabonis’ days in Portland and injury-detoured career better than Walton. Walton has tried a dozen times but still cannot make it past the first couple of pages of the basketball masterpiece The Breaks of the Game by David Halberstam, because it is “too personal,” he said, in detailing his painful injuries and fracturing from the Portland organization. In Portland, Sabonis was professional and practiced, went home, played in games, and repeated the routine. Instead of developing relationships with teammates, he would most often hang out with the support staff. In the following season, Wallace threw the towel at Sabonis during a timeout of a game against the Lakers. Sabonis had accidentally smacked Wallace’s face earlier when he collided in the post with O’Neal. During that period, the complexion of Portland’s roster changed again. An over-the-hill Shawn Kemp arrived, and a before-his-peak Jermaine O’Neal was traded. Players fought among themselves and with the legal system. Even Sabonis’ wife, Ingrida, was charged with a DUI a couple of hours before Portland faced Utah in Game 5 of the 2000 Western Conference semifinals. Sabonis took a one-year sabbatical during the 2001-02 season before returning for one final season with Portland. He left as he had arrived, on his own terms and on his own time. Sabonis averaged 12 points and 7.3 rebounds in his seven NBA seasons. He finished his professional career in 2005 with Zalgiris, his hometown Lithuanian club and the same team he began with 24 years earlier. I asked the question that Sabonis has no doubt answered a hundred times. How would he have fared if he were never hurt or if he had entered the NBA at an earlier age? Would he have been the edge Portland needed in winning championships in 1990 and 1992 instead of just making finals appearances? The next day, Sabonis quickly accepted his enshrinement. Walton stood next to him as his presenter. The speech lasted 49 seconds. The trip to Springfield was Sabonis’ first to the United States since he retired from Portland in 2003, when, as a 38-year-old, he played in his NBA-high 78 games. Just like that, he had again disappeared from American eyes only to resurface eight years later for less than a minute. He will travel this week to Portland, where his induction will be celebrated before returning home to Lithuania. Sabonis runs a basketball school there, and to say the country of a little more than three million is basketball-obsessed is an understatement. “It’s like a little Indiana,” Nelson said. A year before Portland selected Sabonis, the Atlanta Hawks picked him in the fourth round of the draft. The league voided the selection because Sabonis had yet to turn 21. In today’s rules, international players who are at least 22 are automatically eligible for the draft. Those younger have to declare their intentions to enter. Portland received a fair amount of criticism for aiding Sabonis’ recovery, most notably from U.S. head coach John Thompson. At the time, Sabonis had not signed with Portland, and the Trail Blazers’ help allowed him to play in the 1988 Seoul Olympics, where he helped the Soviet Union beat the United States in the semifinals and capture gold.